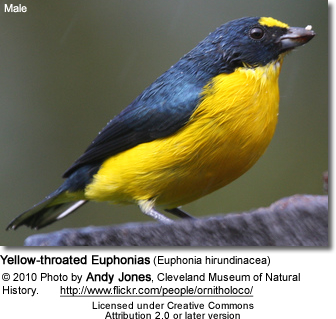 The Yellow-throated Euphonias (Euphonia hirundinacea) are Central American finches that occur naturally from southern Mexico to Panama. Besides the already mentioned counties, their range includes the following: Belize, Colombia, Costa Rica, El Salvador, Guatemala, Honduras, and Nicaragua. This species is relatively common within its range. They inhabit subtropical or tropical dry and moist lowland forests and heavily degraded former forest. They occur in pairs throughout the year but do not defend territories. 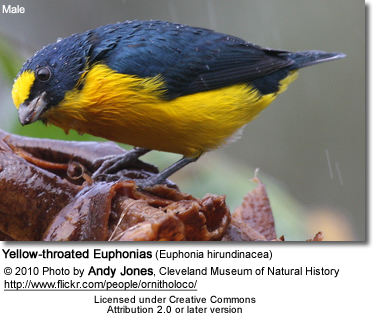 Yellow-throated Euphonias have short tails and stocky bodies. 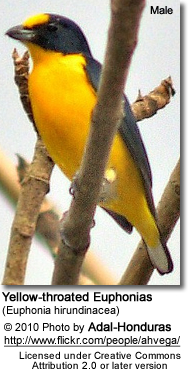 Female plumage is dull green. 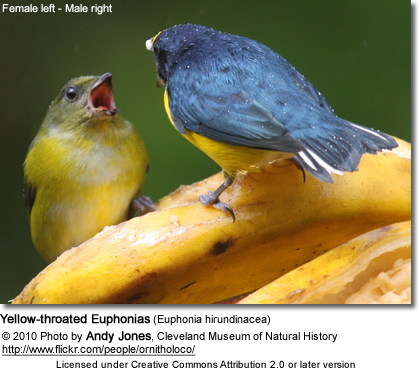 Similar Species: The Yellow-throated Euphonias resemble the Scrub Euphonias. However, the Scrub Euphonias have black throats and the throats of Yellow-throated Euphonias are yellow. The pair builds the covered nest together, and the clutch size is five. Breeding usually commences in May, near the onset of the rainy season. Another clutch may be laid in early August. The average clutch consists of five eggs, which is unusually large for a tropical passerine. The incubation lasts 15 days and usually starts the day the last egg was laid. Only the female incubates, although both sexes feed the nestlings. The male usually stays close to the nest and guards it. The nestlings are fed fruit regurgitated by their parents. Their diet consists of a variety of tree-borne fruits. In particular, they are known to feed on mistletoe berries, which make up about 20% of their diet.